This will be the final royal themed post of a weeklong series marking the celebratory birth of Prince George of Cambridge. It was, far and away, my favorite post to research and write. His Royal Highness Prince George whom I wish I could smother with cuddly kisses. The first ten years of Prince George’s great grandmother, Her Majesty the Queen, life was fairly normal. There was really no thought given to Princess Elizabeth inheriting The Crown. It has been suggested that because her head was not filled with the prospect of grandeur she had a lack of ego which in turn is what makes her so good as the ruling monarch. The Queen was born at 17 Bruton Street in Mayfair, London. She was raised at 145 Piccadilly in London. It was a town house in Hyde Park which was destroyed by bombing during WWII. The Queen and her sister Princess Margaret loved their home which was filled with toys. Perhaps it was this rocking horse that helped instill the Queen’s loved of horses. … as well as several dachshund and corgi dogs. The princesses also had a miniature car of which their governess, Marion Crawford, would supervise the drives. Like most other little girls Princess Elizabeth had her favorite dolly’s and carriages. The Princesses also enjoyed wee gardening tools scaled to a child’s size. But there is one gift that still remains and is enjoyed by Royal children even today. The Queen and Princess Margaret were given a grand playhouse known as Y Bwthyn Bach (which means “The Little House” in Welsh) in 1932 by the Welsh people when she was six years old. It sits on the grounds of Windsor’s Royal Lodge. Princess Beatrice recently helped remodel the small house, as a tribute to her grandmother’s Diamond Jubilee. The house was modeled after a traditional Welsh cottage featuring a thatched roof and whitewashed walls. Inside is 1930’s period furniture and decor. It was originally done in shades of blue. It has now been made over in soft shades of pink. You can see the sitting room from the doorway. The portrait over the mantle is the Duchess of York, later known as Queen Elizabeth, the Queen Mother. It is two-thirds the size of a real house and features plumbing and lighting. An infant Prince Charles was photographed in his elaborate bassinet by Sir Cecil Beaton. But he also played in an “off the shelf” playpen. Prince Charles had a floral couch in his nursery where he enjoyed playing with blocks. 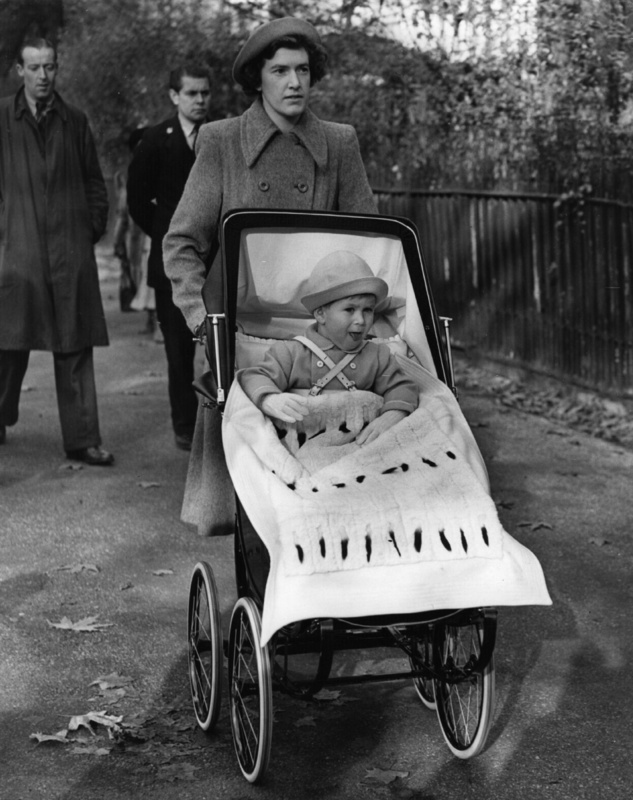 Prince Charles often enjoyed a stroll with his nanny, Mabel Anderson, in a glorious pram topped with an ermine fur lap blanket. His father, Prince Philip carted him down a small hill in a regular red wagon. Of course he too enjoyed the playhouse. …and ponies and horses as pets. Prince William had his share of stuffed animals. As well as a simple plastic rattle. You can spot a glimpse of Princes William and Harry’s red and green nursery which was quite posh. Yet they still enjoyed dressing up and playing on a traditional swing set. Not much is known about new Prince George’s nursery. The rumor is that the primary pattern is herringbone brown. The young family is currently living in Nottingham Cottage. They will soon settle into apartment 1A at Kensington palace. It was once the home of Princess Margaret and is currently undergoing asbestos removal and refurbishing. We do know that Prince George’s father, Prince William, has bought him a bear. The Duchess purchased a Moses basket from the shop Blue Almonds a few months ago. She also purchased a Bugaboo pushchair (stroller) in blue. 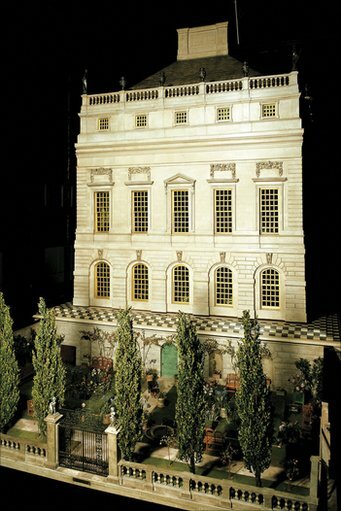 Queen Mary’s Dollhouse which can be viewed by the public at Windsor Castle. It was built for Queen Mary between 1921 and 1924 by renowned architect Sir Edwin Lutyens. It was made to a scale of 1:12 (one inch to one foot) and stands over three feet tall. The top of the doll house slides straight up to open. The dollhouse contains electricity, running water, an elevator and a grand staircase. Another view of the lovely marble floors. The entry has hand painted wallpaper and a gorgeous chandelier. The throne room includes artwork featuring the likenesses of King George V and Queen Mary. There was a bedroom for the King. His Majesty’s loo even has a toilet that flushes. The Queens bedroom features a tiny clock made by Cartier. The wall covering in the Queen’s sitting room is made of real silk and the desk sits on a wool rug. A better view of the painted ceiling. The dollhouse features a library of 171 books of short works. Many of the volumes were written exclusively for the dollhouse by some of the leading writers of the day. They include, to name a few, Sir Arthur Conan Doyle (author of the Sherlock Holmes series), J. M. Barrie (Peter Pan), Rudyard Kipling (The Jungle Book) and Edith Wharton (The Age of Innocence). There are exact copies of the crown jewels in the strong room. The wine cellar contains real miniature bottles of the finest wine and champagne. Of course there is a Royal nursery as well. All in all, a royally beautiful childhood. « Can I Pick A Name or What? This has been a wonderful series, Laura! You really outdid yourself in researching the Royals. I discovered so many things that I didn't know and found everything so very interesting. I think the young royal family is so adorable, and I can't even imagine how gorgeous this baby is going to be with such a handsome dad and beautiful mother. Let's just hope he doesn't look like his Grampa…..heehee! The Man and I have been speculating as to why Queen Elizabeth hasn't stepped down and passed the crown. We are thinking she doesn't really want Charles to be King — hmmm? Any theories? So Fascinating Laura! 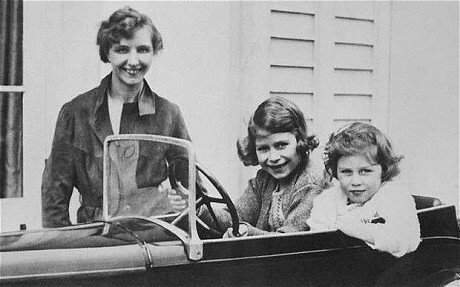 Queen Elizabeth looks so happy with her children when they were young! She was also quite beautiful….maybe if she smiled more now. Enjoyed the miniature house and doll house etc! I still have a hard time imagining calling that little sweetheart 'George'. But I'm sure it will grow in me! Love that dollhouse! Wow! Thanks for such a great post and all the time it must have taken you to research all of this. Really enjoyed it! Isn't that dollhouse AMAZING. I think I could stare at it for hours and if given the chance I dare say actually even PLAY with it, grown woman that I am and all! I don't know about HRH the Queen not being filled with thoughts of grandeur. Her childhood probably was relatively down to earth, but it certainly wasn't any average childhood. I would say that duty has certainly been important to her, and I would imagine that keeps “one” from becoming overly grand. Oh! That doll house is just SO adorable!! Thanks for all the research, and for the sharing! you have made me VERY HAPPY with this post!!!!!!!!!! thank you!!! Thank you for your intensive research and posts. Your posts are always entertaining and informative. I'm married to a man named George who is worthy of being a king by virtue of his wonderful character and empathy so I think they've chosen the perfect name. As for Elizabeth not being expected to be Queen, although the public still hoped and expected that 'David' would marry and have children, King George V loved 'Lilibet' so much that he hoped exactly the opposite; although he had long wanted 'David' to marry and have children, he and Queen Mary were so disgusted with him that they hoped he would rule unmarried so that Elizabeth, whom they adored, would inherit. what an interesting post! Thanks for sharing it! I love that little cottage and would move in for sure!!! I wish Will, Kate and new baby lots of luck and that they will be a happy family! I so enjoyed reading this post. Thank you for bringing the Royals to us! Love this! I think we're all interested in seeing how Will and Kate “do” parenting. Love that precious little Bear! what a brilliant and enjoyable post. thank you, loved it laura! What an interesting post! Thanks for doing the research and sharing it! Laura, I just love your royal posts as they are always so informative and interesting! I love all the old pictures and stories you added. I'll have to catch up on them over the weekend, but this one is just fabulous! The new Prince is just precious! !